Well that didn't take long. In just a couple of years, we content marketers have done a heck of a job painting ourselves into a corner. Several corners, actually. Our penchant for snappy axioms—most of them a derivative of "set content free"—has put content marketing on a collision course with otherwise sensible business objectives. When I ran content strategy at a large marketing technology vendor, I was a purist. I felt that content should never be "locked" behind a form, that credibility demanded the brand's logo be "zeroed out," and that embedding even the subtlest sales message was a cardinal sin. I was a purist because I could afford to be. Because of my employer's size, momentum, and diversity of marketing programs, we didn't have to force readers to complete a form to download an e-book or video. We didn't examine each content expense in the same way a small or early-stage company must. The luxury of time granted us the freedom to trust that those who valued our content would be more likely to buy from us when they were good and ready. At an early startup, however, time and money reign supreme. Its marketers must find ways for all content—even creative assets such as infographics—to generate business, not just buzz. Every investment must advance the company. So when I joined a mobile technology startup called Kinvey as VP of marketing, I quickly realized that I had been perpetuating a series of false choices. The content marketer in me had been at odds with the lead marketer in me. 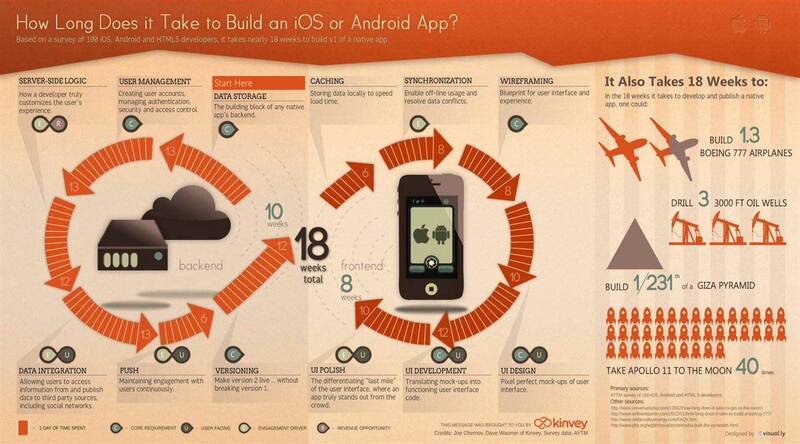 I now hope to set the record straight, using as an example Kinvey's latest infographic, "How Long Does it Take to Build an iOS or Android App?"